Born in 1941 in Whitehall, Wisconsin, John Melby was brought up in Pulaski, Tennessee, where he began his musical studies as a trombonist/violinist/violist while still a child. He attended the Curtis Institute of Music, from which he earned the Diploma (1964) and B.Mus. (1966); the University of Pennsylvania (M.A. in composition, 1967), where he studied composition with Henry Weinberg and George Crumb; and the Music Department of Princeton University (M.F.A., 1971; Ph.D., 1972: both in composition); his composition teachers there were Peter Westergaard, J. K. Randall, and Milton Babbitt. He taught from 1971 until 1973 at West Chester State College (now West Chester University) in Pennsylvania; in 1973 he was appointed to the Composition/Theory faculty in the School of Music of the University of Illinois at Urbana-Champaign, where he was Professor of Music until his retirement in August of 1997, just as his daughter was getting ready to begin her college education, and where he now holds the title of Professor Emeritus. He is best known for his music written for computer-synthesized tape, either in combination with live performers or for tape alone, though in recent years he has concentrated upon the composition of large orchestral works. His Symphony No. 1 (1993) was given its premiere performance at the University of Illinois in March of 1994 by the University of Illinois Symphony Orchestra, under the direction of Paul Martin Zonn. Melby’s compositions have won numerous awards and have been widely performed both in the United States and abroad. He was the recipient of an NEA Fellowship in 1977, a Guggenheim Fellowship in 1983, an award from the American Academy and Institute of Arts and Letters in 1984, and an associateship in the University of Illinois Center for Advanced Study in 1989-90. His awards include several at the International Electroacoustic Music Awards (Bourges, France), where he received First Prize in 1979 for his Chor der Steine for computer-synthesized tape. In recent years, he has composed a series of concerti for various instruments and tape, including two violin concerti, two flute concerti, two violoncello concerti, and concerti for piano, viola, clarinet, contrabass, English horn, a double concerto for violin and English horn with tape, and a concerto for tape and orchestra in which (reversing the usual situation) the tape is the soloist instead of the accompaniment. He has also composed for the voice, his Two Stevens Songs, one of several works incorporating poems by Wallace Stevens, being one of his most frequently performed compositions. Other compositions in his catalogue include two piano sonatas, three string quartets (the most recent of which includes tape), songs for voice and piano, pieces for larger ensembles, both with and without tape, numerous compositions for tape alone, an unpublished opera, and a recent symphony (see above). He has recently completed a large work for lyric baritone, chorus (SATB) and large orchestra based upon William Cullen Bryant’s poem Thanatopsis , and he has begun work on his Symphony No. 2. His music is published by Margun Music, Inc. and Merion Music, Inc. (Theodore Presser Co.), and recorded on the CRI, Advance [now unfortunately out of print], New World, Centaur, and Zuma labels. John Melby is a member of Broadcast Music, Inc.
for Large Orchestra 4030 3(Picc./A.Fl.) 3(E.H.) 3(Cl. in A/B.Cl./Cb.Cl.) 3(Cbsn.) – 4 3(Flugelhorn) 3(B.Tbn.) 1; Timp. 3Perc. 2Hp. Str. for Orchestra 21:30 3(Picc.) 3(E.H.) 4(E-Flat Cl., B.Cl.) 4(Cbsn.) – 4 2 3(B.Tbn.) 1 Flugelhorn; Timp. 3Perc. 2Hp. Str. Melby’s orchestration…is imaginative and assured. 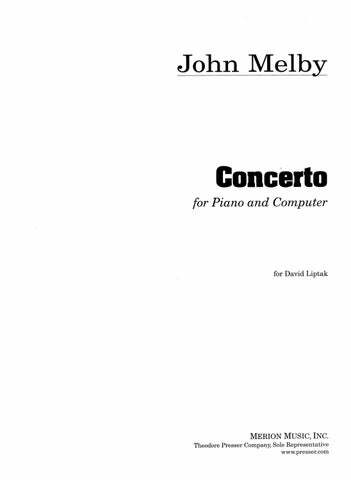 A very worthwhile release…I hope we will be hearing more of Melby’s computer concertos on CD. Four awards from the International Electroacoustic Music Awards (Bourges, France), including 1st prize for Chor der Steine in 1979.